As digital signage continues on the path to becoming a mainstream and widely-adopted solution, we have observed continual advancements in the display industry, at large. Corning Incorporated, the company well-known, for Gorilla® Glass in Consumer Electronics, offers its thin, chemically-strengthened Gorilla Glass to the digital signage market as an advanced glass solution for high-performance displays and digital signage. Aside from the widely-adopted Corning Gorilla Glass, now on over 1.2 billion consumer electronics devices worldwide; the company has also become popular for its concept video “A Day Made of Glass,” which went viral with millions of views on YouTube. The video shows a world immersed in touch interfaces. Corning’s thin glass solution is aiding in making that world a reality for the digital signage industry. The thin profile of the glass, when direct bonded to a touch sensor, enables a more intuitive touch experience for the user and yields an immersive display with improved touch accuracy and sensitivity compared to conventional cover-glass solutions. In addition, the direct-bond approach paired with the thinness of Gorilla Glass decreases a technical phenomenon referred to as parallax. Parallax is often experienced by the user when they are viewing a display from an angle through a thick cover glass. The thick cover glass and user’s line of site result in a misalignment between the perceived and actual touch target positions which can be extremely frustrating for the user, as the touch surface can be either unresponsive or incorrectly responsive to the user’s touch inputs. Thin Gorilla Glass helps to significantly reduce parallax and delivers upon the promise of responsive and accurate touch. Corning’s Gorilla Glass for use in digital signage can be produced as thin as 0.55 mm, just four times thicker than a human hair, and up to 2.0 mm, which is still much thinner than conventional soda-lime glass solutions deployed in current digital signage applications. Corning’s chemically-strengthened glass solution, when directly bonded, enables sleek-profile, aesthetically-pleasing displays without compromising the rigidity and durability of the display. Now, digital signage manufacturers can have thinness, durability, and beauty with Gorilla Glass. Advanced digital signage solutions are well-suited for the public display market, which is growing due to increased penetration into the retail, hospitality, and transportation sectors. These sectors generally deploy digital signage in areas of high visibility which are also their highest traffic areas. Deploying digital signage in such areas necessitates durable and scratch-resistant displays. 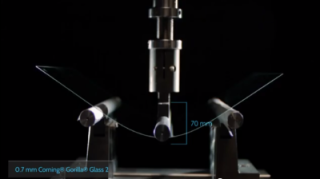 Corning’s proprietary fusion process creates glass with an unparalleled surface quality. This precise, automated process produces glass with clean, smooth, flat surfaces with outstanding optical clarity. The high optical clarity of the glass is well suited for high-resolution displays and allows high-performance displays to retain their color vibrancy.